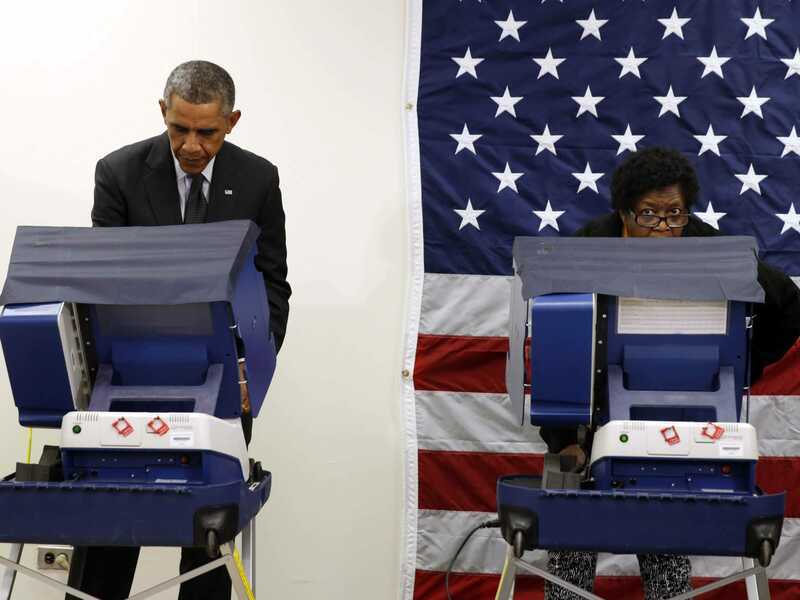 REUTERS/Kevin LamarqueA woman looks up from her voting booth as U.S. President Barack Obama takes part in early voting at a polling station in Chicago, Illinois October 20, 2014. The Federal Reserve finally put an end to its quantitative easing program on Wednesday in a move that had been widely anticipated for a very long time. Meanwhile, the stock market roared back to record highs. This week brings us a lot of important economic data including the jobs report, auto sales tallies, and manufacturing PMIs. 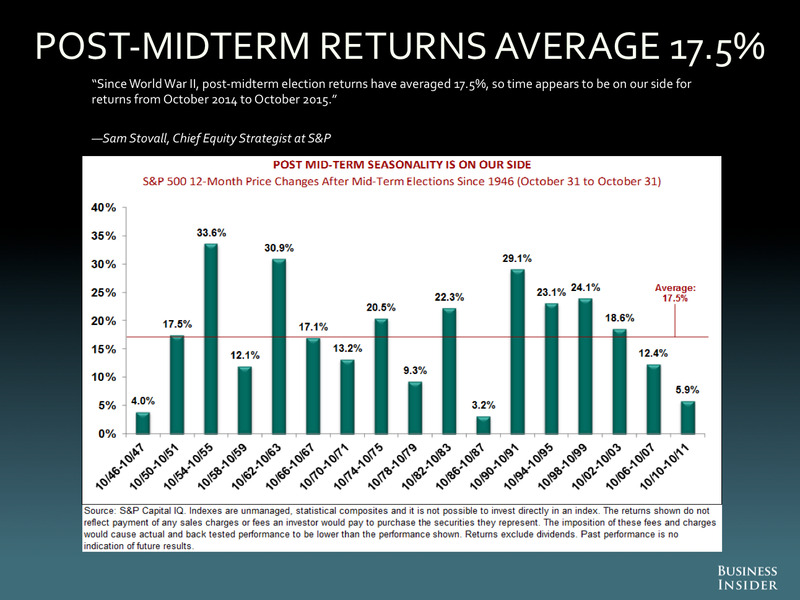 The US will also be holding its midterm elections on Tuesday, which should clear out some more uncertainty for investors. “If we have a really uncertain situation, where the Senate is divided and candidates are threatening recounts, that’s really not good,” said Newedge’s Robbert van Batenburg to Reuters. Economists interpreted this as the Fed being hawkish, signaling that tighter monetary policy via higher interest rates would come sooner than later. Construction Spending (Mon): Economists estimate spending climbed by 0.6% in September. “Stronger homebuilding activity as housing starts rebounded 6% should boost construction activity, although the concentration of gains in starts in multi-family units provides less upside per unit than if credit-restrained single-family activity were doing better,” Morgan Stanley’s Ted Wieseman said. Factory Orders (Tues): Economists estimate orders declined by 0.7% in September. “Durable goods orders decreased by 1.3% in September, suggesting a return to more normal changes in activity after the volatility in July and August (owing to a surge in non- defence aircraft orders in July),” Barclays economists noted. Initial Jobless Claims (Thurs): Economists estimate the pace of weekly claims fell to 283,000 from 287,000 a week ago. “Initial claims have been below 300k for seven consecutive weeks and continuing claims have been steadily trending lower, suggesting solid improvement in labour market performance,” Nomura economists said. Wall Street’s equity strategists are more or less telling clients “I toldja so” in the wake of the S&P 500’s incredible rebound from October 15 lows. Like we said above, the focus has shifted to the midterm elections. As far as stock market returns are concerned, there are obviously always a lot of variables to consider. But generally speaking, the stock markets inclination is to go up. 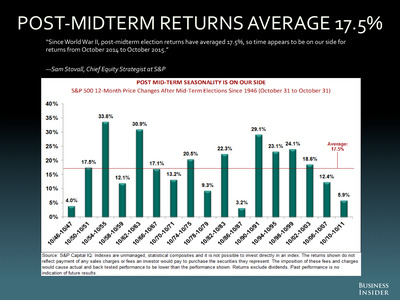 “Since World War II, post-midterm election returns have averaged 17.5%, so time appears to be on our side for returns from October 2014 to October 2015,” S&P Capital IQ’s Sam Stovall said.